NPR's newsroom during election coverage on Nov. 8, 2016. The network has been rocked in recent weeks by allegations of sexual harassment. As NPR's Board of Directors meet in Washington, D.C., this week, the network finds itself confronted by a series of dispiriting developments: a CEO on medical leave; a chief news executive forced out over sexual harassment allegations; the sudden resignation of a board chairman; fresh complaints over inappropriate behavior by colleagues; and a network roiled by tensions over the treatment of its female workers. On Wednesday, NPR Board Chairman Roger LaMay announced that he was stepping down at the end of his second one-year term. LaMay, who remains on the board, said he needed to devote more time to running the popular Philadelphia public radio music station WXPN, where he is general manager. However, according to a knowledgeable source, LaMay is the subject of a complaint filed with NPR alleging past inappropriate behavior. Few additional details are currently known. "I finished my second term and chose to not run again," LaMay said in a statement. "I did not make this decision based on a third party story about my personal life over a decade ago. I welcome any Board Committee review." NPR's public relations staff did not directly respond to questions about LaMay. The network said it "encourages people to come forward with concerns they have about situations that have made them feel uncomfortable" and that it takes "both the allegations and their consequences seriously." NPR's problems with sexual harassment are seen as especially disheartening because of the feminist legacy of its founding. The network was built in part on the foundation created by trailblazing female journalists such as Nina Totenberg, Linda Wertheimer, Cokie Roberts and Susan Stamberg. "It's really prided itself on being a place where women and men are treated equally and fairly. That's at the core of who we are," said Rachel Martin, a host of the NPR show Morning Edition. "Because of that, this cuts deeper. We have thought of ourselves — perhaps naively — as exempt from something like this." Women have served as CEO, board chair, news chief, general counsel and chief operating officer, as well as the heads of all major shows and reporting desks at NPR. Often they hold a majority of positions as the network's top hosts and war correspondents. "Because it's so antithetical to this organization's norms and code of conduct," Martin said, the harassment scandal "carries a heavier emotional distress." Conversations with two dozen NPR female journalists suggested some fissures lie along generational lines. Desire for swift action against employee misbehavior and the executives who did not immediately punish it, strong among younger staffers, seemed less pronounced among some of those with more years under their belt at the network. Michael Oreskes, NPR's senior vice president of news and editorial director, was forced to resign on Nov. 1 after accusations surfaced that he had previously sexually harassed women. Two women who said they had been seeking jobs at The New York Times when he was Washington bureau chief there nearly two decades ago accused him of forcibly kissing them. Multiple younger female journalists at NPR said he left them deeply uncomfortable by embarking on intimate conversations over extended dinners or by engaging them repeatedly in exchanges via unsolicited private messages. Oreskes offered a general apology on the day he resigned: "I am deeply sorry to the people I hurt. My behavior was wrong and inexcusable, and I accept full responsibility." NPR CEO Jarl Mohn has since acknowledged that the network had privately rebuked Oreskes after two employees had filed complaints in the fall of 2015, just months after his arrival. Mohn has also since taken medical leave to address dangerous hypertension levels, following a near-fatal aortic rupture earlier this year. Following Oreskes' departure, NPR actively encouraged employees to share complaints and concerns of inappropriate behavior. Women have come forward to NPR officials to share accounts of what they say are unwelcome approaches and inappropriate remarks or behavior. Some of these reported episodes may not appear dramatic in isolation, in comparison with sexual harassment and assault scandals that have cost the careers and reputations of Hollywood producer Harvey Weinstein, Fox News' Roger Ailes and Bill O'Reilly, and the comedians Bill Cosby and Louis C.K. Yet many female NPR journalists, especially younger ones recounting unwanted attention, say the accretion of seemingly lesser incidents created an insidious climate for women in early stages of their career at the network. Acting CEO Loren Mayor, NPR's chief operating officer, has struck a solicitous tone that has inspired hope among many newsroom employees. But journalists interviewed for this story said much more work needs to be done to knit together relations between employees and senior management. The promise of a family sensibility at NPR, part of the fabric of the place, was damaged by bruising contract negotiations this past summer and worsened by the conviction the network failed to act promptly to address concerns over Oreskes' behavior. At least four veteran editors recounted that they shared their staffers' concerns about Oreskes' behavior toward women with the network's HR or legal departments more than a year ago. The network has started to take steps on more recent complaints as well. NPR has placed David Sweeney, recently promoted to the position of chief news editor, on paid administrative leave as it reviews recent allegations about his conduct. Sweeney is among the network's top five news executives. The network has declined specific comment but says it takes allegations seriously and takes the responsibility of reviewing them seriously as well. Three female journalists — two of whom are still NPR employees — confirmed that they had filed complaints against Sweeney following the Oreskes revelations. Their complaints stem from isolated encounters in 2002 and 2007 and a series of interactions in more recent years. Conversations with friends of each of the women validated, in broad strokes, their accounts, saying that they had spoken about the incidents either contemporaneously or before the Oreskes scandal. Sweeney declined to comment for this story, saying he was cooperating with the network's formal review process. The three women were all in their late 20s when the incidents allegedly occurred and expressed varying degrees of unease over filing complaints. But each said she shared her experience to ensure that inappropriate behavior that was tolerated or ignored in the past would be scrutinized more seriously now. "I felt that NPR didn't maintain a safe place for reporting these things when they happen," said one former producer, no longer at the network, who filed complaints about two men at NPR. The producer said some people emerge out of such experiences unscathed. "I knew that wasn't me," she said. In the encounter from 2002, Sweeney and a producer drove around the Virginia suburbs of Washington, D.C., in a luxury car being used for a story she was working on. After stopping in a glitzy bar for a drink — "we were pretending to be fancy," the producer said in an interview — she said Sweeney asked her to pull to the side of a quiet street and then leaned over and kissed her. She said she froze and that after he stopped she kept driving. She told him later she did not want any personal relationship. She spoke on condition of anonymity for this story because she wanted to be able to apply for jobs at the network in the future. A second female producer hoping to make the difficult jump to on-air reporter says she approached Sweeney for advice in 2007. They met for drinks during happy hour at a Latin restaurant. According to the woman, as they were talking Sweeney unexpectedly went in for a kiss. The former producer said she pulled back, grabbed her purse, and ran to the bar's bathroom, where she waited until he left. She recounts her shock in the moment and decided later to pretend it had never happened. "When it happened, I asked myself, did I do something to make that seem OK?" the journalist said. She said she never wanted to interact with Sweeney again. This producer later became an on-air reporter at the network, where she still works. Neither woman said she lost career opportunities as a result or that Sweeney behaved inappropriately toward her subsequently. "In some ways, he was very kind," said the first former producer. "It was awkward for a little bit. Once we did start working together, he was for the most part nice." The producer turned reporter said she was emboldened to report Sweeney because of the Oreskes scandal. "I wouldn't want a woman to be out there by herself," she said. "I wouldn't be able to live with myself if there was someone else who complained ... if there was a pattern." Lauren Hodges, an editor on NPR's Newscast team, also told this reporting team that she filed a complaint against Sweeney and two other colleagues, all of whom she says subjected her to unwelcome attention. "I felt I was a joke," Hodges said. "The only reason people wanted to get close to me was because they were interested in me romantically or physically." Hodges joined NPR's Newsdesk on a temporary basis. She said the unwelcome attention began prior to NPR's move to its new headquarters in 2013. Hodges recalled Sweeney repeatedly calling her over for conversations in his office and asking about her personal life. In emails reviewed by this reporting team, he offered cookies, an invitation to a network banquet, holiday wishes and other greetings. She also said he joked about her going on vacation with him. Hodges recalled receiving unsolicited gifts including a rosary bead necklace. A friend told this reporting team that she had warned that Sweeney might have a crush on her after Hodges showed her one of his messages on Facebook. At the time, Sweeney was Hodges' direct boss. Sweeney has held a variety of ascending news management jobs, including assistant national editor, national editor, deputy managing editor, managing editor and now his current job. Hodges said she stopped responding to his messages and appeals and was taken off NPR's Newsdesk after a year there in a meeting with Sweeney and another senior manager. Hodges said this shift caused her to consider quitting NPR and journalism. She said she could not gauge whether the news manager and another midlevel editor passed her over for career advancement like promotions or training because she would not make herself available to them socially. She said her experience at the network was later redeemed by other senior male news executives who praised her work and encouraged her presence. These allegations lodged by Hodges and the other two women remain under review by the network. NPR is evaluating these complaints but has not taken any permanent action or reached any conclusions. Two of the three women were temporary employees at the time of the incidents they flagged, meaning they worked full time but were not on staff permanently. NPR relies on such temporary employees extensively, a source of tension within the newsroom. It can prove a path for junior journalists to work their way on staff for good. In October, as one measure, there were approximately 100 temporary staffers in NPR's bargaining unit of about 450 journalists, according to SAG-AFTRA, which represents NPR's unionized newsroom workforce. Roughly 70 percent of the temps were women. On Nov. 9, Mayor wrote to staffers about new reporting procedures for sexual harassment concerns and embarked on a series of listening sessions with employees. Acting Senior Vice President for News Christopher Turpin has added more women to senior news leadership positions. "I am deeply committed to doing everything I can to help strengthen and improve our culture," Mayor wrote. She said she embraced the goals for reform articulated by a lawyer who wrote her on behalf of a large group of female employees. 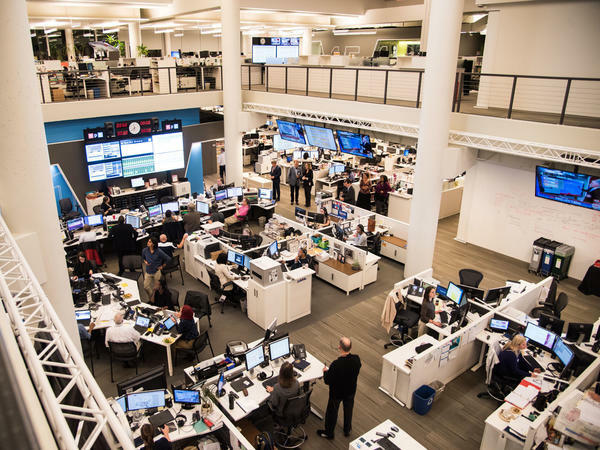 Barrie Hardymon, a senior editor at NPR's Weekend Edition, says that a growing cadre of corporate managers is viewed as increasingly distant by the network's workforce. "The communication problems exist at every institution," Hardymon said. "They feel particularly personal here, because this is a really, really close work environment and people care about the mission here." Younger women at NPR especially felt there was "a gulf between themselves and particularly senior managers — and that it was hard to be heard," Hardymon said. "I really do see evidence of a will to change. This is a moment that I do think can be seized on." Disclosure: NPR's David Folkenflik and Merrit Kennedy reported this story under the guidance of Chief Business Editor Pallavi Gogoi and Deputy Managing Editor Terence Samuel. Under standard procedures for reporting on NPR matters, NPR's corporate and news executives were not allowed to review what they reported until it was posted. No editors or reporters involved in this story attended any private NPR staff meetings related to the subject. Kennedy was also recused from matters involving Lauren Hodges, whom she considers a close friend as well as a colleague. More fallout here at NPR today over sexual harassment concerns. The chairman of NPR's board of directors has decided to step down from that role, and a senior editor is now on leave. NPR media correspondent David Folkenflik and NPR reporter Merrit Kennedy report complaints have been filed against both men. David joins us now from our bureau in New York. Hi, David. DAVID FOLKENFLIK, BYLINE: Hey, Elise. HU: So what can you tell us about the complaints and who they're against? FOLKENFLIK: Well, obviously this is all against the backdrop both of national sexual harassment scandals and, you know, a real crisis and also those things besetting this very network - the departure of course of our editor-in-chief Mike Oreskes not so many days ago. What we're reporting today is that Roger LaMay - he was the chairman of the board. He finished his second one-year term. He chose not to run again. There was a complaint filed against him. He characterized it in a note to me - or just not so very long ago where he said, I did not make this decision based on a third-party story about my personal life over a decade ago. I welcome any board committee review. We don't have a lot of details about the nature of that. The claims against David Sweeney involve three women, one of whom was willing to be named a - an editor here at the network. The other's a - producers here - still here at the network and a former producer at the network. They have a variety - three different complaints, one stemming back as far as 2002 - an unwanted kiss - 2007, another attempted kiss in what was supposed to be a - drinks to talk about career advancement. And the third - a series of interactions that were interpreted by a much younger female colleague who was subordinate - directly subordinate to David Sweeney, currently on leave, our chief news editor. She said that basically she interpreted these things as romantic overtures in an unwanted, unsolicited way and unrequited and that it went on some time and that she wondered whether certain career advancements she didn't experience was - as a result of not responding to those appeals to her. HU: You mentioned a response from LaMay. What about David Sweeney? What does he have to say? FOLKENFLIK: David Sweeney's on leave. He's one of a handful of the most senior people at the network, although not well-known outside it. And he declined to comment, saying that he's trying to, you know, be responsive to the network and allow the process of review to work. We should stress these things have not yet been proven, and NPR hasn't drawn any conclusions about the nature of these allegations while taking them seriously. HU: David, you've been reporting. And it's no secret of course that there's a lot of tension in our newsroom, especially among younger women. So what has the network done to address that? FOLKENFLIK: You know, we have an acting CEO. Our current CEO, Jarl Mohn, went on leave for medical reasons. He had a near-fatal aortal rupture early this year. So the acting CEO is our COO, Loren Mayor. She has been very responsive. She's been meeting with women in small groups. I've been hearing from women in the headquarters in D.C. where you are that people have found this to be a comforting - sort of first steps, a hopeful sign. She has also said that, you know, she received a letter from an employment lawyer who claimed to be acting on behalf of 200 women at NPR and who articulated a series of desired goals. And Loren Mayor not only spelled them out but said she embraced them, that she wanted to find ways to enact them, that she wanted to include the newsroom in finding out solutions. So these are seen as hopeful first steps. HU: So no chairman of the board and a CEO who's on medical leave - what's next? FOLKENFLIK: Well, I think you're seeing some settling. We do have a chairman of the board, Paul Haaga, who used to have that role - is back in the saddle there. An experienced board member is the vice chair. You know, I think NPR is going to have to figure out whether Jarl Mohn can return to the board full-time. But what you're really seeing is a network and an organization trying to be responsive to what is a sexual harassment crisis, a concern about how women are treated and also a recognition of the fact that they need to really unify this newsroom after a lot of strife, a lot of certainty - uncertainty and a lot of tumult. HU: A fuller version of David's story - David and Merrit Kennedy's story is at npr.org. David, thanks. (SOUNDBITE OF GRIMES SONG, "GENESIS") Transcript provided by NPR, Copyright NPR.